A saturated solution of salt in water can be used to maintain particular values of relative humidity inside containers and can be used to calibrate humidity sensors. A saturated salt solution is made up as a slushy mixture with distilled water and a chemically pure salt. Engineering ToolBox, (2014). Saturated Salt Solutions and Air Humidity. 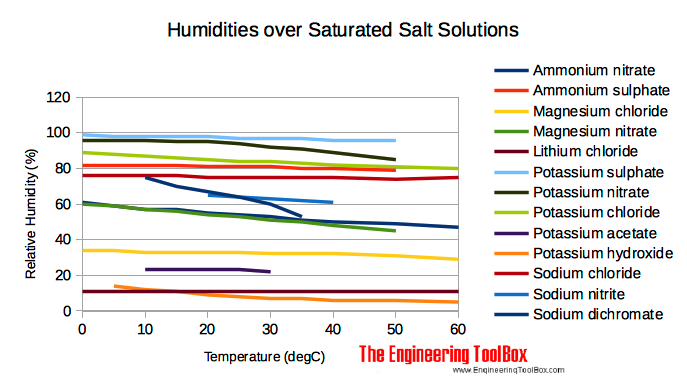 [online] Available at: https://www.engineeringtoolbox.com/salt-humidity-d_1887.html [Accessed Day Mo. Year].